Looking east from Guadaloupe Hill and back through time to a beginning. In 2005, Álamos became the 17th town to be honored as a Mexican Pueblo Magico, “a magical village”. As of 2011, there are 40 such towns and villages in 28 states across Mexico. 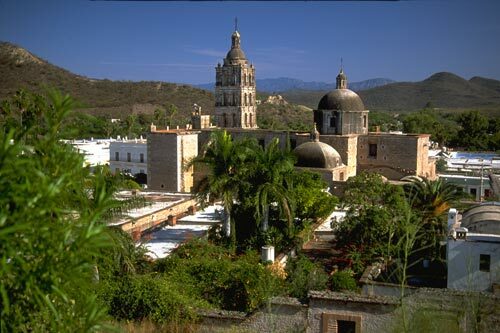 Nearby, El Fuerte, just south of the border in Sinaloa, is also recognized as a Pueblo Magico. 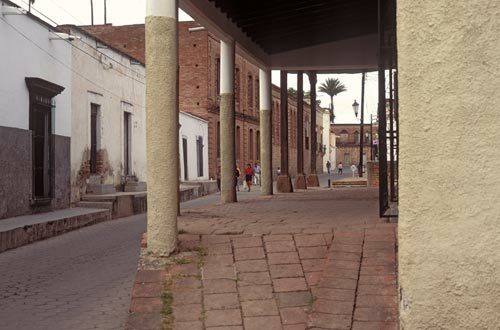 Calle Rosales is a wonderful stroll as one approaches the Plaza and Alameda. Pueblo Magico is “a place with symbolism, legends, history, important events, day-to-day-life. In other words, “magic” in its social and cultural manifestations, with great opportunities for tourism.” Ring the bells,that sure sounds like Álamos, Sonora, Mexico. A spring day walk home as a family returns from shopping. Álamos is a pedestrian friendly town. People walk and ride bicycles from here to there. One can drive across Alamos in minutes or walk across Álamos in less than a hour. The experiences are entirely different. Driving gets you somewhere at a time you feel, or need, to be there. Walking open up possibilities and discoveries as Álamos comes to you at its pace. The experience is in the detail, preservation and sustainability. 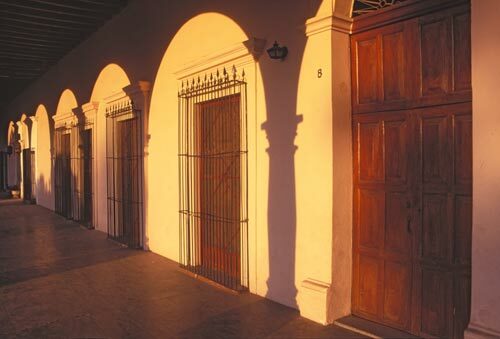 This is a historic Mexican town in the foothills of the Sierra Madre near the Sea of Cortez. This is home to families that cherish the next generation and honor the past. This is a Pueblo Magico. This photo is from the Spring of 1984. 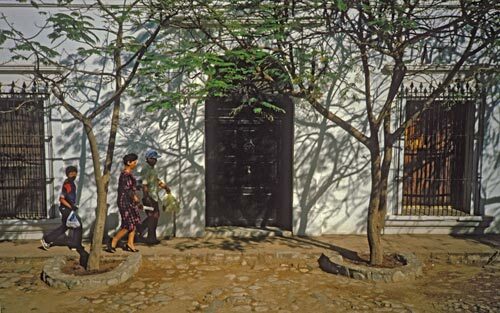 There is a good chance the door, wall, wood shutters, ironwork and trees are the same today as then. The cobblestone may be different but the shadows move as they always have. Sun and shadows play on a wall facing the Plaza, another day has begun. Behind any door is another a world that combines past, present and future. As you walk by their voices speak to you. In a car, there is the sound of traveling, your conversations and inward thoughts. So much of the Álamos experience is what you hear, smell, sense and see. Little things take on great import with observation and reflection. And there are the people who have decided this is where they should be, each with a story, each with a connection, each with an opportunity. Sagas unfold with body posture, gesture and inflection. It is all there to be a part of if one goes with the Álamos flow, or not. Summer is the Álamos season of vibrant color, rains and nights of natural magic and wonder. Lightening on a warm Álamos summer evening is a show to remember. The romantic Plaza is a wonderful vantage point. Rolling thunder punctuates child’s play and lovers embraces.